Is there a more creative group in the NFL than the Seahawks' pass-catchers after scoring a touchdown? Do you not instantly want to know how they're going to commemorate their six points? The Seahawks are the best rushing team in the NFL right now. So if they have the ball on their opponents’ 1, I know what you’re thinking. Not because it’s the most effective way to get in the end zone, but because if they run it, the receivers won’t provide a touchdown celebration. Seriously, though — is there a more creative group in the NFL than the Seahawks’ pass-catchers? Do you not instantly want to know how they’re going to commemorate their six points? As Doug Baldwin said, “It has become an expectation.” And these guys (almost) always deliver. In the Seahawks’ defense, this was their fourth touchdown reception of the game Sunday. If the receivers still had something creative at this point, I’d worry about just how much time they’re putting into these celebrations. To me, this was like a night at the karaoke bar. I have a couple go-tos, but if you send me up there for a fourth song, it’s not gonna go well. For a moment, this looked like it could have been near the top of this list, but only because most people misinterpreted it as a rose ceremony from “The Bachelor.” In reality, it was a scene from “Life,” starring Eddie Murphy and Martin Lawrence. Tight end Nick Vannett played the superintendent who’s trying to figure out which inmate had impregnated his daughter. Baldwin, Tyler Lockett, Jaron Brown and David Moore play the prisoners who, in an “I am Spartacus”-type display, all claim that they’re the dad to protect the real one. The execution was spot-on, but the scene was probably a little obscure for most fans. That said, this was the third TD catch of the game. Lockett catches a 39-yard TD pass, then starts double-dutching in the end zone as Baldwin and Moore swing the jump ropes. 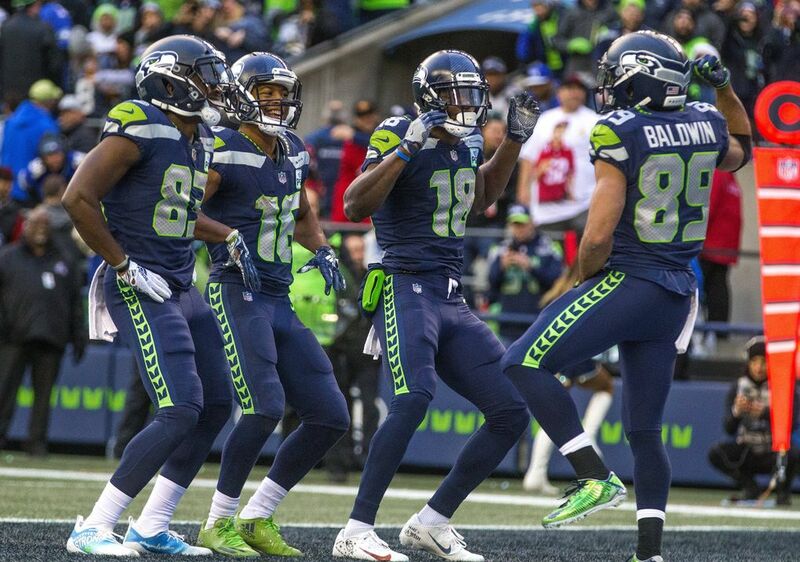 I feel like this was what really kicked off the Seahawks’ celebration craze this year, and I initially had it at No. 4. One problem, when I Googled, “double dutch end zone celebration,” the first result wasn’t the Seahawks. Turns out the Lions did the same thing last year. Baldwin reels in his first touchdown reception of the season, four other pass-catchers join him in the end zone on their stomachs, fake paddle, then hop on their boards. 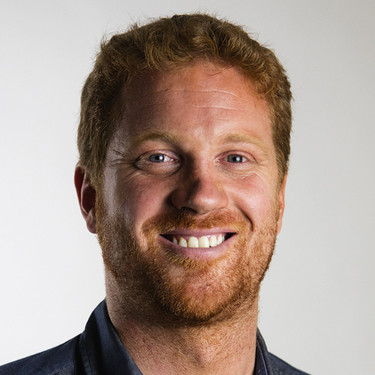 Russell Wilson ribbed them postgame and said they have to work on their technique. But it got Troy Aikman to laugh on the broadcast. Well done. 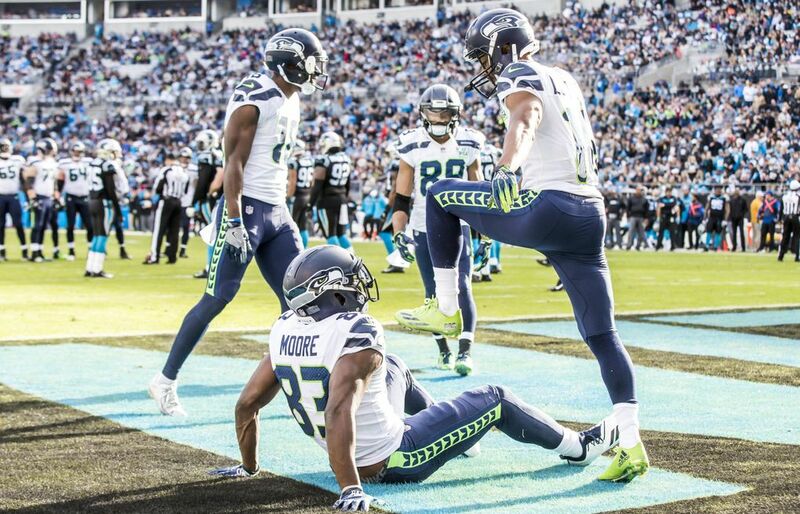 There was a little confusion about the Seahawks’ second celebration Sunday. Some thought they were digging a hole in the ground and burying the ball. But it was quickly made clear that they were digging for gold as one would in California in 1849. This one had everything: originality, history, and best of all — trolling. As far as choreography goes, this might be No. 1. The receivers channeled what seemed to be their inner N’Sync and delivered something JT would be proud of. Most everyone in the press box was laughing as it was happening. So why isn’t it higher? Because almost none of us actually knew what it was. 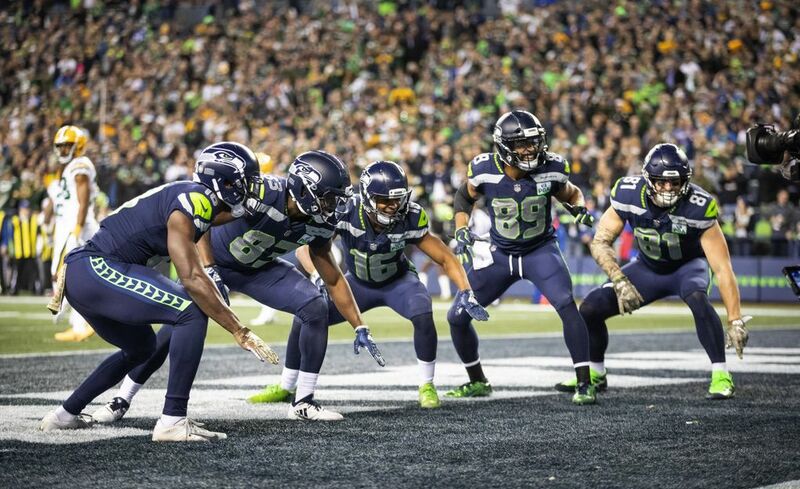 In a homage to the movie “Drumline,” Baldwin and Lockett line up across from each other with Brown next to Doug and Moore next to Tyler. 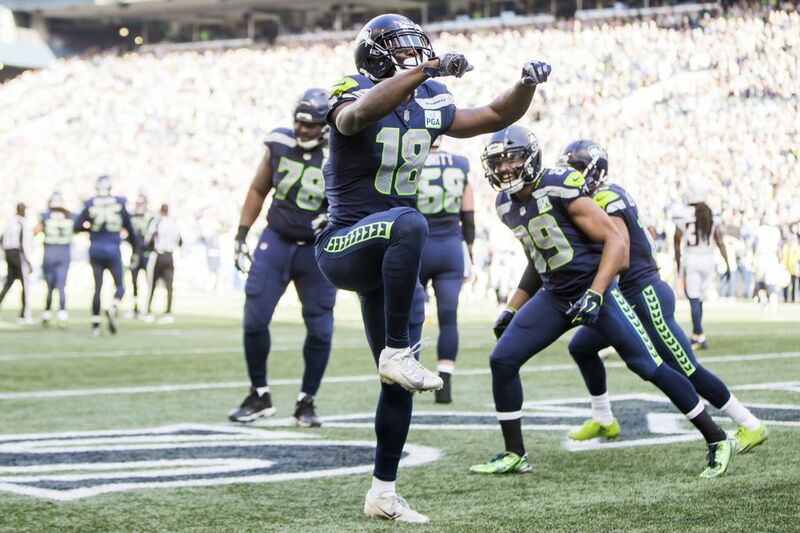 They start banging their imaginary drums, but when Lockett gets too close, Baldwin takes him out with a haymaker, just as Nick Cannon did in the film. Don’t worry, Lockett would get revenge. No troll job here. Pure tribute to one of the greatest Seahawks ever. After Brown caught a 4-yard touchdown pass in the first quarter, the receivers relived the moment that sent them to the Super Bowl they would eventually win. Playing Colin Kaepernick, Brown threw a pass toward Lockett (Michael Crabtree), but had the ball tipped by Baldwin (Sherman) into the hands of Moore (Malcolm Smith.) This could have gone poorly. Instead it went perfectly. And though Sherman said he didn’t see it, he had to have appreciated it. After Ed Dickson caught a 12-yard TD pass in the second quarter, Baldwin stepped into the batter’s box and got in his stance. Lockett then beaned him on the leg with the football, prompting Doug to charge the mound. But this wouldn’t be like “Drumline.” Lockett clothes-lined Baldwin as fellow receivers joined the brawl. Even Wilson, who wasn’t part of the rehearsals, got in on it. “I came in from the bullpen,” he said.